Toddler slides can help your kids enjoy their time and burn off some energy. At the same time, these toys can help them develop their motor skills. There are many different types of slides, and finding one that suits your child can be a challenge. When shopping for these products, you also need to consider the safety of your child. This means you should not buy a slide that is steep. Also, you should avoid products that have sharp edges as these can easily injure children. Ideally, the edges should be curved. The slides should be made of non-toxic materials since children are known to eat random items. It is still important for you to watch your toddler as they play on the slide since accidents may occur. You may even have to teach them how to use the slide since some kids may not naturally know how to use it. In this review, we will highlight some of the best toddler slides in 2019. Features – Different slides come with different features. It can be hard to determine what features your child would be interested in, so you may just have to go for one which looks fun. One feature you should look out for is the room underneath the slide. Products with this space are meant for hide-and-seek and can be great for daycares. Also, you can consider getting a toddler slide with a roof since these can be very stable. At the same time, the roof can allow you to place a toy periscope for your kids to look over the slide. Material – There are many different materials used to make slides. Most of them are made using durable plastic. This material is hard enough and can support the weight of a toddler. At the same time, it is quite light and easy to transport. You should always check the weight limit of a slide before getting it for your child since some may not be thick enough to support your child. Safety – The safety of your child should always come first. Ideally, the slide you get should be made of non-toxic materials. Also, they should have raised sides so that the child is directed straight to the bottom of the slide. For extra safety, you should choose a slide which slopes gently. 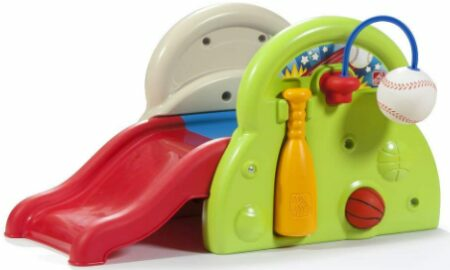 Little Tikes First Slide is designed for beginners. It is quite small and can be used either indoors or outdoors. Only one kid can ride the slide at a time, and it can take children of up to 60 pounds. There is no specified height limit in this slide, but it is best suited for children of under 50 inches. This toy can be assembled simply and quickly without using any tools. The three pieces of the slide snap together, so you should be able to assemble it in just five minutes. The slide is also easy to unfold. Normally, you should be able to unfold it in seconds. If you have limited storage space, you will find this slide highly convenient since it is only three feet long. You can fold it and place it in a corner of your house. The foldability of the slide also makes it great for traveling. This product combines a small tunnel, a basic rock climbing wall, and a slide. The slope in this slide is quite gentle, and this makes it ideal for kids. Up to two kids can use the slide at the same time. It can only accommodate children of up to 45 pounds. With a height of about 18 inches, this slide would be best for children of between 1 and 2 years. Older kids will find it too small. Some people have had great experiences using this slide indoors, but according to the manufacturer, it should strictly be used in the backyard. The slide is quite light and small, so you should not have trouble carrying it to the backyard. It has a gentle slope, but your kids should always be supervised when they play with it. If you have trouble assembling the slide, you can watch some YouTube videos on how to set it up. This is a three-in-one sports center product that includes a basketball hoop, a molded-in soccer goal, and a baseball. The baseball is tethered, so you should not worry about your kids losing it. The play center also has a baseball bat. With the bat and baseball, children can develop their motor skills without having to chase the ball across the room. Your kids can also climb up the two junior steps and enjoy going down the slide. Since it is quite small, you should not let kids over 3 years old use it. It is important to assemble this product correctly since it will otherwise slip and move sideways. This can be dangerous to toddlers. Also, make sure you place it on a reasonably soft surface so that it stays steady. With this product, children can enjoy playing with a ball pit, slide, and toss target. The toss target includes 50 colourful balls and is sure to impress your child. The jungle gym is ideal for young children of up to about 3 years. However, many people get the slide for kids of 5 or 6 years. It can handle a maximum load of 150 pounds. If your child has trouble getting into the jungle gym, you can buy them a ramp. Normally, children who can walk should be able to easily enter the jungle gym. This product is made using durable and high-quality plastic. Assembling the jungle gym is easy since the plastic parts interlock. The jungle gym can be used indoors, and it should always be placed on a soft surface like a carpet. This slide is designed with a durable vinyl cover. It is ideal for classrooms and daycare centers. The product is designed with bright colors, and that makes it appealing to children. 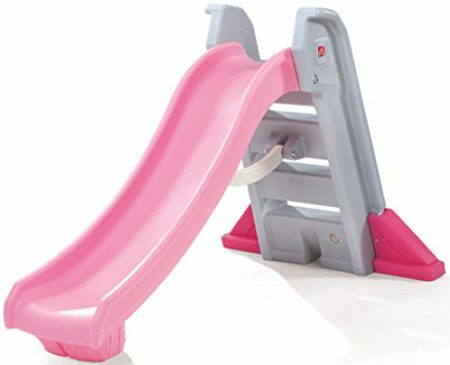 With this toy, your child will only need to climb up the two steps and go down the slide. It is made with a soft but firm material, so it is quite safe for kids. The material will cushion the hard landings of the kids. Still, you will need to watch your kids when they use it as other unprecedented dangers may arise. An advantage of this product is the fact that it is light and portable. These qualities make it easy to transport the slide. It can be folded into two for storage. If you have messy kids, you don’t have anything to worry about. The surface of the slide is covered with water-resistant vinyl, and that means you can wipe it any time children spill foods or liquids on it. The Step2 Big Folding Slide is meant for children between the ages of 6 months and 5 years. It is small enough to be used indoors. The four steps of the slide are quite steep, so you should always be there to watch your children use it. For the first days, you should hold your children as they go down the slide. Storage of this slide is quite easy. You just need to fold it into two and hang it next to a wall. The slide does not have a defined age limit, but kids of up to 50 pounds should be able to use it comfortably. The slide can be used indoors or outdoors, but you should always place it on a smooth and stable surface. Children like using slides even in poor weather. If you want them to play indoors in such weather, you can buy them the Indoor Stair Slide toy. 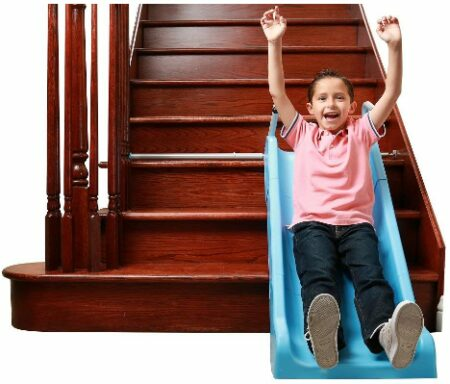 This slide is placed at the bottom of your staircase, and here, children can easily use it. The Indoor Stair Slide comes with a powder coated steel frame, handrails, and an adjustable steel bar. The steel bar is used to attach the slide to your staircase. It is adjustable up to 54 inches. This product comes with a 100% worry-free backing from the manufacturer. This playset is designed for children between the ages of 2 and 6. 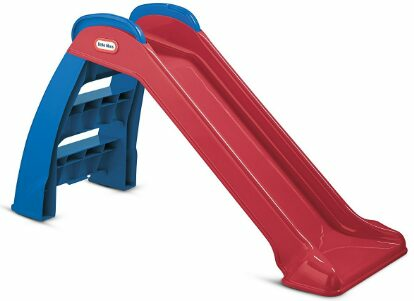 The steps of the slide are made of wood and are quite large, so your children should have an easy time using it. The top of the steps is covered by a shingled roof which is meant to create the look of a playhouse. In the play station, there is a periscope which rises above the roof. This periscope can be raised or lowered, depending on your children’s needs. Also, it can be pivoted. The product has a double wall, and this makes it durable and maintenance-free. 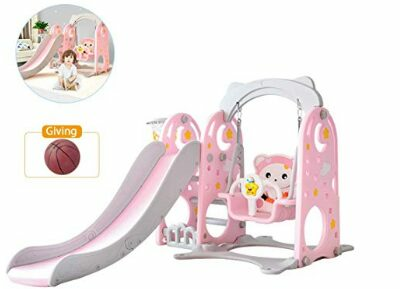 This playset combines a slide, basketball hoop, and swing. Although the set performs many functions, it occupies a very small space and can be placed indoors. It is constructed using environmentally-friendly high-density polythene. If your child accidentally eats this material, they will be safe since it is also non-toxic. The edges of this slide set are designed with rounded edges. With such edges, the children will not hurt themselves, even if they hit their heads. The swing set can accommodate up to 150 pounds. You can adjust the height of the swing and the width of the seats to suit your children. The height of the basketball hoop can also be adjusted to create a challenge for your kids. As an extra safety measure, the manufacturers included a safety belt on the swing to prevent rollover. 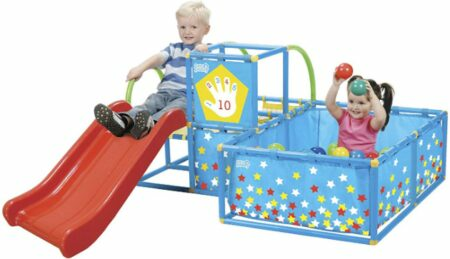 The Little Tikes Hide and Slide Climber can accommodate up to three children. It is meant for children who are under 60 pounds. The product is designed with a slide and a small chamber at the bottom. This can be used for simple games like hide-and-seek. The slide itself is gentle and wavy. It is quite safe for kids. The slide is meant to be used outdoors, particularly because it takes up too much space. You can still use it indoors if you have sufficient room. However, it should not be placed on a hard surface since it will keep slipping around. You can place it on a carpet or rug. 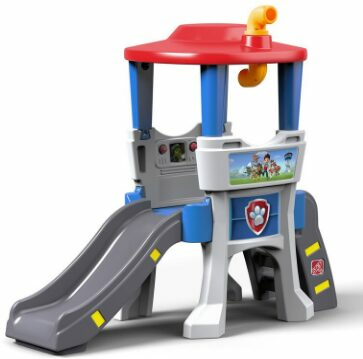 The Little Tikes Hide and Slide Climber can be used safely by kids who are above the age of 2. This slide is designed with a roofed section at the top. There is a periscope which your children can use to scan the surrounding areas. You should always leave the roof on as it makes the entire structure more stable. It is more exciting to play with this toy outdoors as there is more to see with the periscope. If you choose to place it indoors, make sure you place it on a soft surface. The toy is quite small and can fit in a normal-sized room. Unlike other slides, this one is quite complicated to assemble. You can expect to spend about 30 minutes putting it together. People with little experience in assembling such items can even spend hours trying to fix it. For the assembling process, you will only need a screwdriver. Strengthens Core Muscles – Climbing the steps to the slide will help your children strengthen their core muscles. Core muscles are the muscles that stabilize, align, and move the trunk of the body. Strengthening these muscles will help your children develop good posture at a young age. Playing on a slide is a fun and affordable way for you to strengthen the core muscles of your toddler. Builds Co-ordination – Toddlers will usually not be able to go down the slide on their own in the first few sessions. This is because they will be unable to coordinate their movements properly. The slide will help them learn how to coordinate their legs and hands as they move up the steps and go down the slide. Improves Social Skills – Slides are usually used in daycare and other toddler institutions. The children get to interact with each other as they share the slide. They have to communicate with each other in order to determine who will go next. All this social interaction makes them more capable of fitting into society as they grow older. Ensure your Child is Supervised at all Times – Even if you go for a product with many safety features, your child can still get into some accidents. He might fall off the slide or even land on another kid. He might even start licking or eating parts of the slide. To make sure nothing bad happens, you will have to keep an eye on your child at all times. If you want to set up the slide at home, you will have to put it in a place which you can see. Choose a Well-Known Brand – A good way to filter out potentially low-quality products is by checking the brand of the slides. Don’t choose the lowly-priced products since they can easily get damaged and injure your child. Also, such manufacturers are usually able to price their products cheaply because they use poor materials to make the slides. These materials can be toxic or just unsafe for your children. Don’t Exceed the Weight Limits – The weight limits are set based on the thickness of the construction materials. If you exceed the weight limits, you are likely to damage the slides and potentially injure your children.